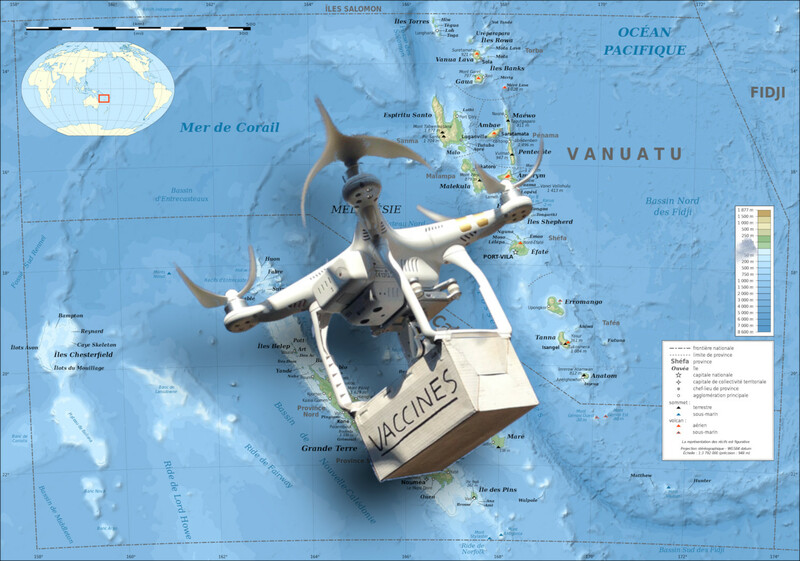 Vanuatu and UNICEF have issued a request for tender inviting drone companies to bid on a contract to deliver vaccines along the nation's chain of tiny, remote islands -- 83 volcanic islands strung along a 1600km atoll. Current vaccine delivery uses 9-seater puddle-jumper planes that hop from island to island, landing on grass airstrips, but this is slow and inefficient, and frequently delayed by factors like jeep breakdowns at an island's clinic. Drone companies see this contract as a way to prove out (and shake down) the idea of drone delivery, going beyond the one-shot stunts from the likes of Google and Amazon. That precarious process just gets the vaccines to the main clinic on each small island, notes Vasquez. Each island also has many remote and isolated villages, whose inhabitants may not visit the clinic. “It’s very traditional, and many villages are ruled by a chief,” he explains. “People live in family groups and don’t leave, so there’s been no need to build roads between one village and another.” When UNICEF workers set out to bring vaccines to the villages, they often hike for hours over volcanic mountain ridges. “And you need to keep the vaccines cold the whole time,” Vasquez says wearily.